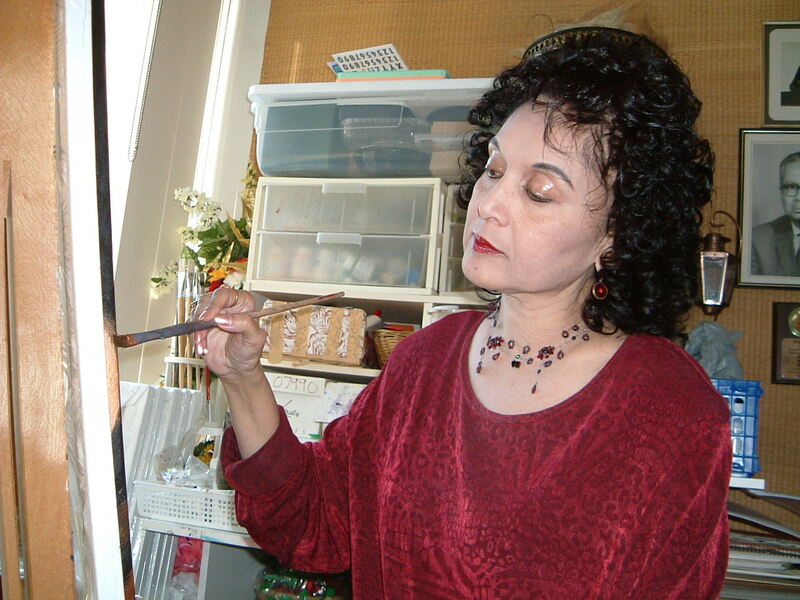 Bio Suparna Ghosh is an Indo-Canadian writer and painter based in Toronto, Canada. Her words and visuals are collaged to create narratives and yarns, myths and mysteries, and she often incorporates her poetry into her paintings. She has recited her poems at several venues to the accompaniment of musical instruments, particularly the sitar. She has published and exhibited her works in galleries in Toronto, New York and major cities in India, and lately in several juried and group shows. Publications, readings and awards A collection of poems and drawings, Sandalwood Thoughts, was published by The Battered Silicon Dispatch Box in 2004. Dots and Crosses by the same publisher, is a long prose poem with sketches, and a musical CD based on the same book, were launched at the Arts & Letters Club (A&L) in November 2006 and January 2009 respectively. Her latest book, Occasionally, features poems in free verse and the ghazal form of poetry in classical Indo-Persian style, one of which has been translated into Urdu and set to music. A CD is included with the book. Suparna Ghosh has published poems in several journals and anthologies, including the Delhi London Poetry Quarterly, a journal published in the U.K.; Verse Afire, a publication of the Ontario Poetry Society; Laurel Leaves, a publication of United Poets Laureate International among others. She was profiled in a special edition of PoetCrit, a literary journal published in India featuring international writers, when it celebrated 25 years of Indian English Poetry. She was short-listed for the Montreal International Poetry Prize and published in their Global Poetry Anthology. Among other awards, she won the grand prize for the Artists Embassy International Dancing Poetry Competition, and her poem was choreographed and staged at the California Palace of the Legion of Honor in San Francisco. Prior to immigrating to Canada, Suparna Ghosh published poems in literary magazines, e.g. Thought, in India; she was profiled as a poet and painter in Youth India, a national magazine focusing on the youth. In Toronto, Suparna was one of the founding members of the Art Bar, the longest running weekly poetry reading series in Canada. She and poet Ruth Colombo were the founding members of Pegasus, a poetry workshop at the A&L, where poets read and discussed poetry, either their own, or that of other poets. She was invited to speak to the Literary Club at the A&L on the subject of the ghazal form of poetry. At York University, she gave a presentation about the relationship between her poetry and paintings, and at the Theosophical Society of Edmonton, she read a paper on the universality of the writings of Nobel prize-winning poet, Tagore. With students from various countries at the prestigious Jawaharlal Nehru University in Delhi, India, she explored the subject of Migration to North America and how it related to her writings and paintings. In 2016, she presented a paper on ghazals at the World Congress of Poets. She reads her poetry regularly at the Art Bar, the A&L, and other venues. Membership The League of Canadian Poets; Canadian Authors Association; Ontario Poetry Society; International Writers Association; United Poets Laureate International; the Arts and Letters Club of Toronto Exhibitions and awards Suparna exhibited her paintings at the All India Arts & Crafts Society, New Delhi and several Other Major Group Shows in India. She continued to show her works after immigrating to Canada. In 2015, Suparna’s black and white drawing was a finalist in an Ontario-wide art competition sponsored by the Arts and Letters Club of Toronto. Publications A collection of poems and drawings, Sandalwood Thoughts, was published by The Battered Silicon Dispatch Box in 2004. Dots and Crosses by the same publisher, is a long prose poem with sketches, and a musical CD based on the same book, were launched at the Arts & Letters Club (A&L) in November 2006 and January 2009 respectively. Her latest book, Occasionally, features poems in free verse and the ghazal form of poetry in classical Indo-Persian style, one of which has been translated into Urdu and set to music. A CD is included with the book. Suparna Ghosh has published poems in several journals and anthologies, including the Delhi London Poetry Quarterly, a journal published in the U.K.; Verse Afire, a publication of the Ontario Poetry Society; Laurel Leaves, a publication of United Poets Laureate International among others. She was profiled in a special edition of PoetCrit, a literary journal published in India featuring international writers, when it celebrated 25 years of Indian English Poetry. Awards She was short-listed for the Montreal International Poetry Prize and published in their Global Poetry Anthology. Among other awards, she won the grand prize for the Artists Embassy International Dancing Poetry Competition, and her poem was choreographed and staged at the California Palace of the Legion of Honor in San Francisco.